A Tourist Visa is issued to any person who visits India for tourism or any other purpose other than business. The validity of Tourist Visa is usually 6 months. A Business Visa is issued for those persons who visit India with the purpose of doing some business related activities. Business includes making sales, getting contacts etc for a company that is located outside India. The validity of Business Visa is usually 1 year or more and can have multiple entries. But for each visit, the person can stay for a period of only 6 months. A Journalist Visa is issued to a journalist or a photographer who visits India for preparing a documentary from India. The validity of Journalist Visa is 3 months. A Conference Visa is issued to a person to attend any International conference. The Visa gets issued only on receipt of the clearance of the conference by the Indian Government. A Transit Visa is issues to a person who wishes to travel through India to reach another destination. Transit Visa should be used for any other purpose and the validity is for a maximum of 3 days. If the person wishes to stay for more that 3 days then another appropriate visa has to be obtained. An Entry Visa is issued to a person of Indian origin who comes to India either for tourism or any purpose other than business. A family member of a person working in India also gets an Entry Visa. In this case, the documents of the employment status of the person have to be attached to the visa. An Employment Visa is issued to any person who works in an Indian company. Even though the contract of the work is more, the visa will be issued for a period of 1 year. It can be extended to 5 years by the MHA/FRRO in the respective Indian state. A Student Visa is issued to the bona fide student to get education from a recognized institution in India. The student can have multiple entries and the validity of the visa is up to the completion of the course. 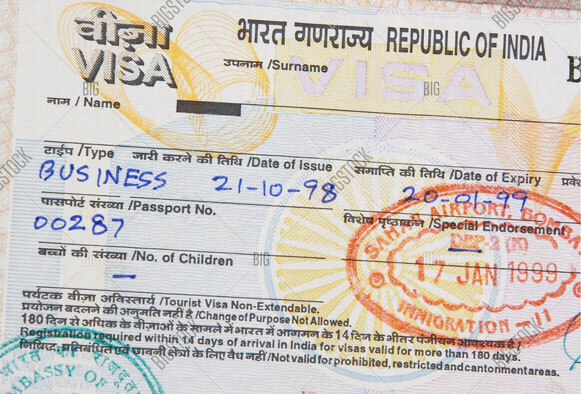 A Missionary Visa is issued to the person who visits India for religious reasons. The visa is single entry visa. A Research Visa is issued to any person who is a Research Professor or a Scholar and also to those who visits India to attend any research conference or seminars. The person is required to apply for this visa 6 weeks prior to their date of travel. A Sports Visa is issued for sportspersons, judges etc who visits India to participate in any sports activities. It is like an invitation letter from India to the sportsperson for attending the sports.